As any number of studies, analyses and personal anecdotes will tell you, it can be a struggle to be taken seriously as a woman in STEM. With rife discrimination, harassment from superiors, and a depressingly sturdy glass ceiling, working in science and tech could take a toll on any woman. And woe betide anyone who wants to be attractive as well as accomplished – certain studies have shown that being beautiful can make it even harder for women trying to navigate a stereotypically "male" field. With that in mind, let's turn to the case of one Lyndsey Scott. Scott has enjoyed a reasonably prolific career as a programmer. After starting – as so many do – with an aim to code games to pass the time in middle school, she eventually graduated from Amherst College with a double major in Computer Science and Theater. She has created apps for iOS – some of which have been featured by Apple. 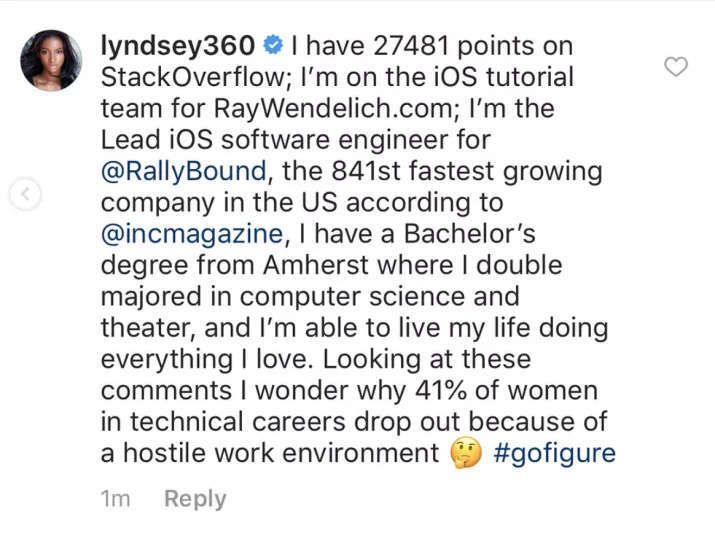 She authors programming tutorials and mentors girls in tech. She's a StackExchange celebrity. And she's also an actress and model, with a resumé that includes names like Calvin Klein and Victoria's Secret. 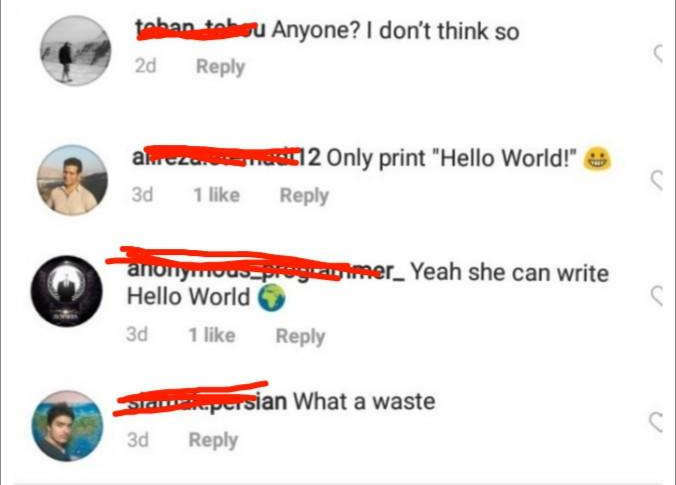 Last week, Instagram account @coding.engineer posted a photo of Scott on the catwalk during a 2009 Victoria's Secret Fashion show, highlighting her abilities in coding. "CODING IS FOR ANYONE" the caption declared. But, despite her not-exactly-obscure achievements, the post started filling up with users mocking the idea that she could possibly possess the skills listed in the picture. Because misogyny. Luckily, as you'd expect from someone with Scott's background in mentorship and advocacy, she did not take this lying down – replying with a list of her achievements for her doubters. "I normally try to ignore [negativity]," she wrote in a follow-up Instagram post, "but decided to jump into the comment section of this one." "Programmers can come in all shapes, sizes, genders, races, etc. so... think twice before doubting other women and girls [you] encounter in tech," she added. After the incident went viral on Twitter and Reddit, other women started sharing their own experiences of sexism in STEM. Talking to Buzzfeed, Scott highlighted the need for STEM fields to be more inclusive to women (here's some ideas on how, FYI). "Male programmers outnumber female programmers by about 5 to 1," she said, "so I think they have to take the lead in holding each other accountable." Scott is not the only person to promote this idea. As people are finally realizing, women and minorities don't need to be encouraged into STEM – what's needed is an end to the discrimination that forces them out. Thankfully, with role models like Scott, as well as initiatives like Jocelyn Bell Burnell's recent multi-million-dollar donation to support minorities in physics research, it seems the tide may slowly be starting to turn.